Grumpy and frumpy, bad. Healthy and happy, good! Hello everybody! My apologizes for being MIA for almost a whole month, it’s been a combination of being sick, entertaining guests from out of town and most recently, recovering from a wisdom teeth extraction. June has been good to me though, I used that recovery time as a good excuse to get some much needed lazy and not do a single thing time, although that only lasted for about half a day. I was up the next day putting together a diaper cake for a co-worker. It’s so hard not to be productive. Anyway, lately I’ve been really been concentrating on eating healthy and focusing on my daily caloric intake… obviously, due to the increase in diameter of my midsection and well, I’m getting older, I can’t just eat whatever the hell I want anymore. That means no more fast food (unless it’s the only option), cutting back on the alcohol intake (ouch! ), cutting back on the red meats (I’ve done this before, not a big deal), incorporating fresh juices with my new nifty juicer (will post about this in the near future) and cooking more healthier meals at home! So far so good, it’s only been about 3 weeks and I’ve already made very good progress. I’m not as grumpy and frumpy as I felt a few weeks ago. I think as long as I keep this up, I’ll be able to find my ideal healthy weight that I’m comfortable with while still eating tasty and satisfying meals. 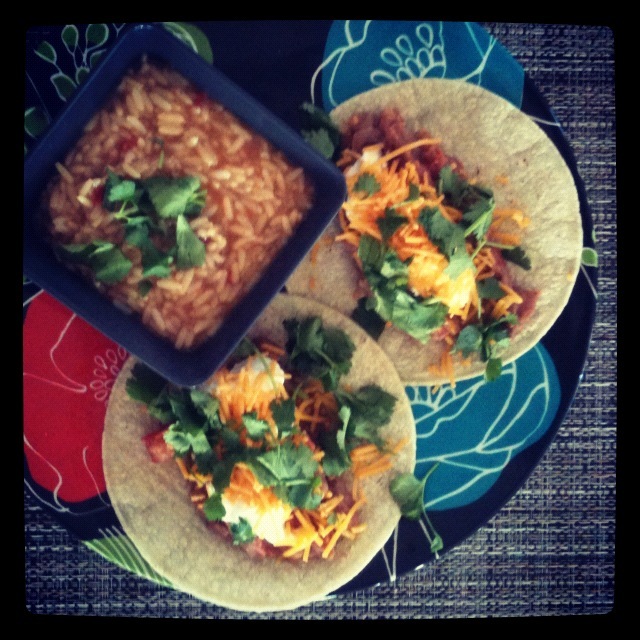 I found a few easy recipes online (they all happen to be vegetarian dishes), some are definitely keepers! I’ve linked the recipe from the source in which I’ve found them. This, I’m so very proud of. What you see right there is my very first poached egg. Poaching eggs were one of those things that always intimidated me, but I found this really simple tutorial at Smitten Kitchen, I was able to face my fear. Oh and this was so good. 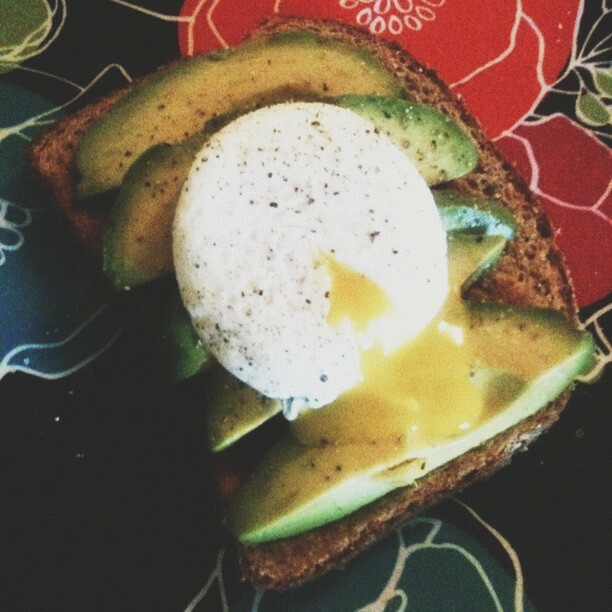 What a better way to start your day with perfectly ripe avocados? Mmm. 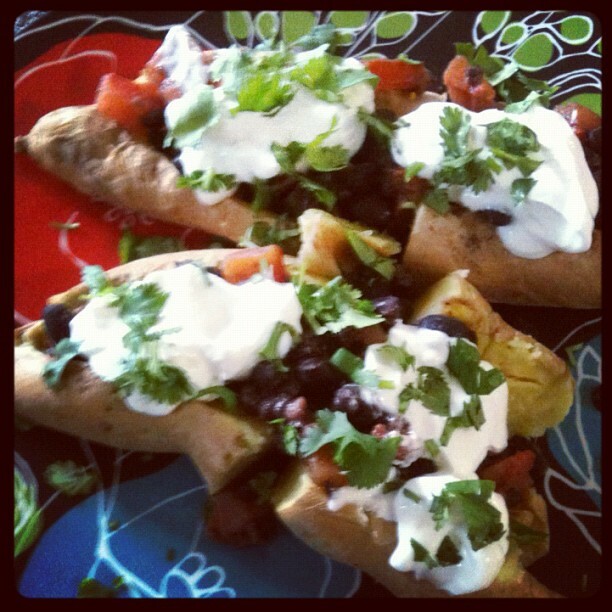 Sweet potatoes stuffed with black beans, low-fat sour cream, tomatoes and cilantro. These were really tasty and they’re deceivingly really filling! What a combination right? These quesadillas are jam packed full of amazing flavor, from the sun-dried tomatoes, mozzarella, feta, red onions, spinach, and if you desire… olives (YUCK! I hate olives, but the boy loves them.) Super easy to make and those colors are so pretty! Yeay! I love falafel. I made that mistake of saying falafels… sorry, I’m Filipino. We tend to add s’s where they don’t belong and remove them where they do… it’s true. A bunch of Auntie’s out there love to go to Starbuck for coffee. Anyway, again this was another recipe that I was a little hesitant to try out at first because I thought it might be complicated but it was surprisingly simple! 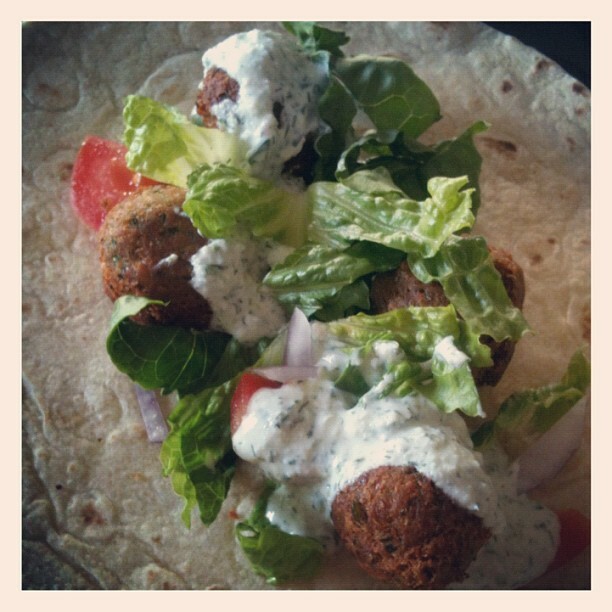 And I have to say my first try at falafel was very successful, they turned out perfect! Crisp on the outside while the inside was nice and moist. 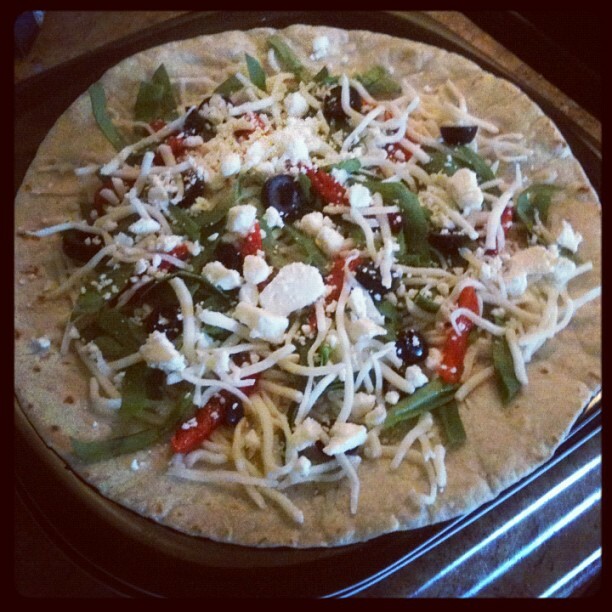 I’ll actually be making this again this weekend because I love it so much. I do have to mention though, using a food processor is key when making falafel. Made this last night, super simple recipe. My only major gripe about it is the amount of onions that the recipe called for. I didn’t even use the whole onion and it was way too much for me! And I really don’t mind onions that much. So if you plan on making this, I’d say only use half to ¼ of an onion… then maybe topping it with some fresh onions with the cilantro. Also, it calls for a ton of tomatoes too, I only had a tomato and a half and that was plenty for me. Oh and I totally forgot to add the lime juice to it… darn it! Don’t forget a squeeze of lime to top it off. 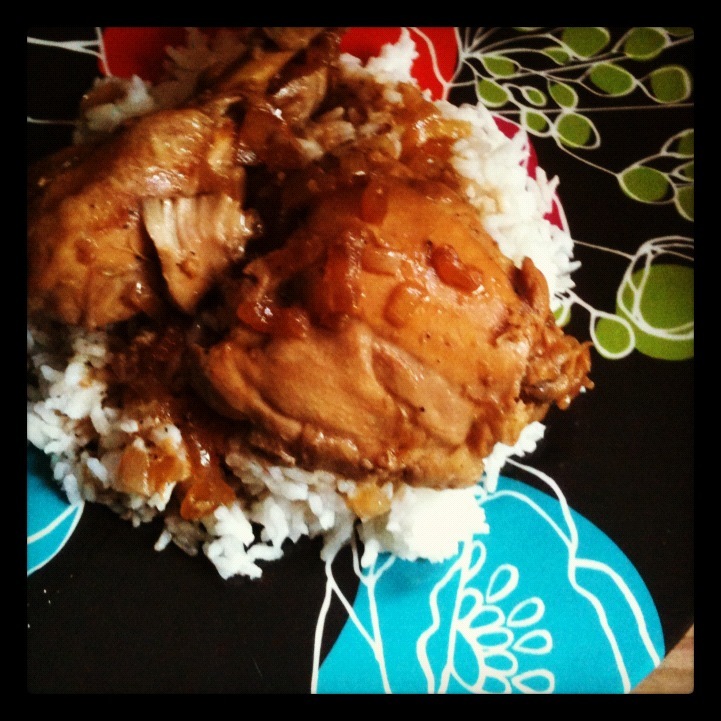 Dish of the month – MAY: Hawaiian Edition. 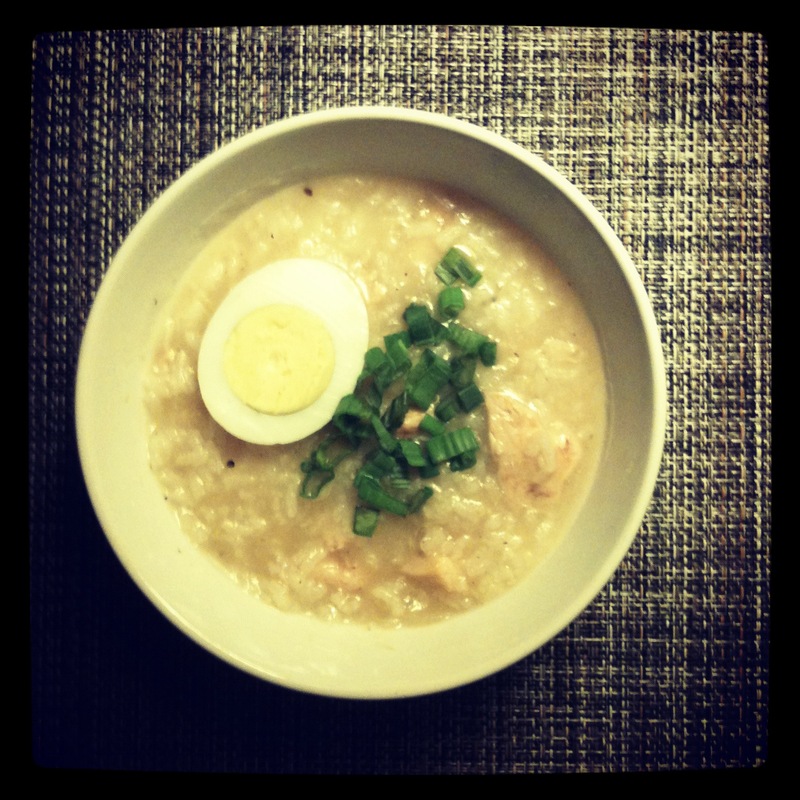 For my dish a month, I’m going to take a break from posting a filipino recipe and instead post the recipe for one of my favorite foods ever… EVER! It’s simple, easy to make and comforting. 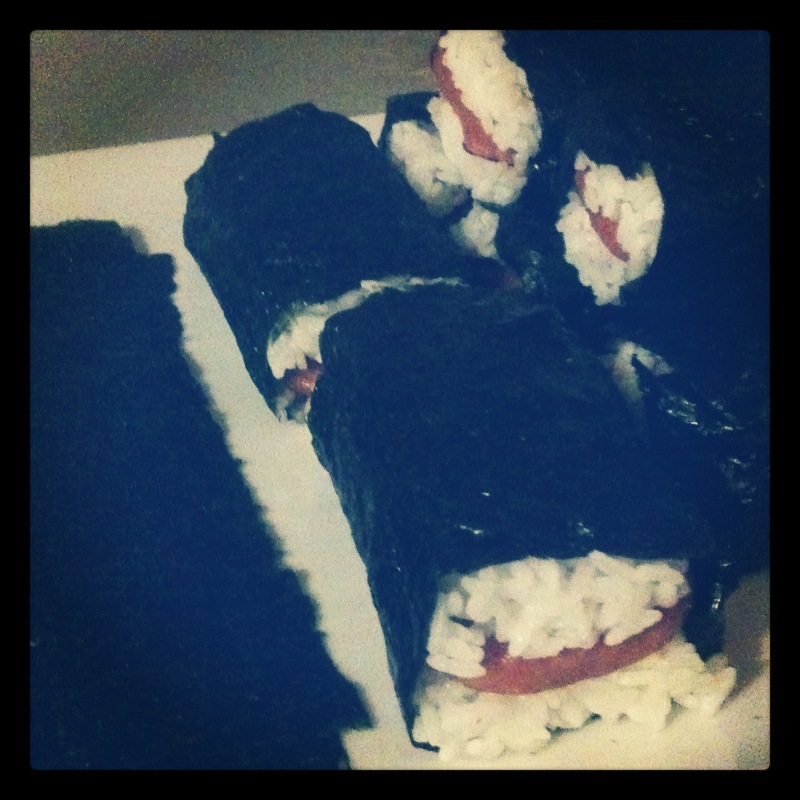 Spam Musubi… it’s basically spam, rice and seaweed. And I know what you’re thinking, that’s super easy right?! (While the rest of you are thinking.. eeeeew Spam, whatever. I grew up eating spam, and I’ve actually converted the boyfriend into an avid spam eater, he’s never had spam until me.) But it’s not just spam and rice wrapped in seaweed… oh no no no, it’s much more than that. Still, it is a really easy recipe that requires no more than 5 ingredients, but it takes a lot of TLC to make each and every musubi. I love it, I love it so much I’d marry it. I’ll also include my “mac daddy salad” recipe… because you can’t have spam musubi without it’s soul-mate: mac salad. About 3 cups of cooked white rice. 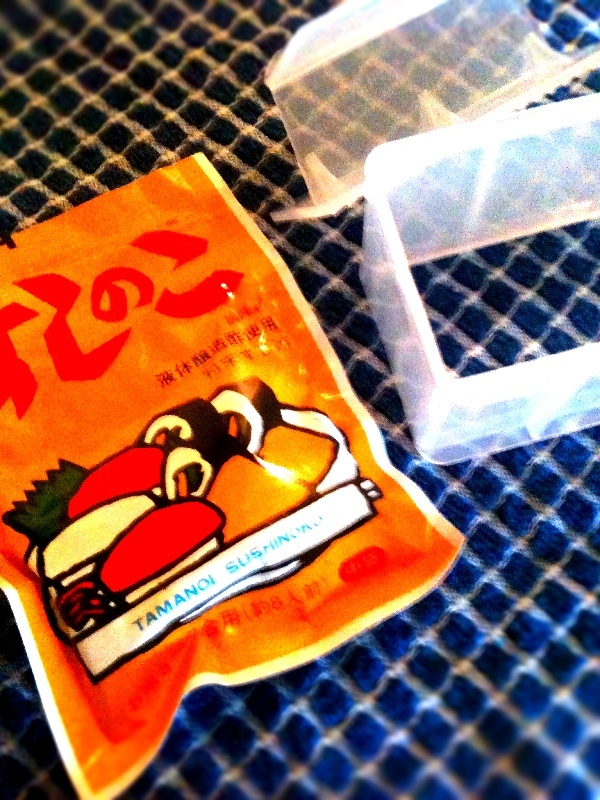 Musubi mold… this DOES exist! I also found this at Marukai. This isn’t super necessary but I find it really handy when I’m putting the musubi together, especially handling the hot rice. But you can get creative and use something else or nothing at all, before I had the musubi mold, I had this perfectly sized little tupperware.. but it was accidentally thrown away during the move. I’ve heard of people using the spam cans, but I wouldn’t see how effective that would be… anyway, let’s move on. Begin by cooking your rice. While that’s cooking prepare and cook your SPAM. Once you have all of your cooked ingredients, I like to prepare my musubi makin’ station. I’d keep my rice in the cooker that way it stays warm (the seaweed adheres better when you’re using hot rice). Then I’d have a clean surface to work on. A couple of bowls: one for some sushi seasoning (you won’t need too much, just enough for two generous sprinkles for each musubi) and one for the oyster sauce. Take the bowl of oyster sauce and dilute it with some water so that it has the consistency of soy sauce. You also need a plate to stack your finished musubi on. Now comes the fun part.. this does take patience. But it’s soooo worth it! Take your musubi mold and place inside a seaweed piece (if you’re not using a mold or anything, then you’d just lay your seaweed flat on the surface) be sure that the correct side is up, for the ones that I use you would put the “shiny” side down.. I’m sure they’re the same for all. Anyway, so I go in this order: rice, sprinkle of sushi seasoning, drizzle of diluted oyster sauce, SPAM, drizzle of oyster sauce, rice, sprinkle of sushi seasoning.. now close and repeat! 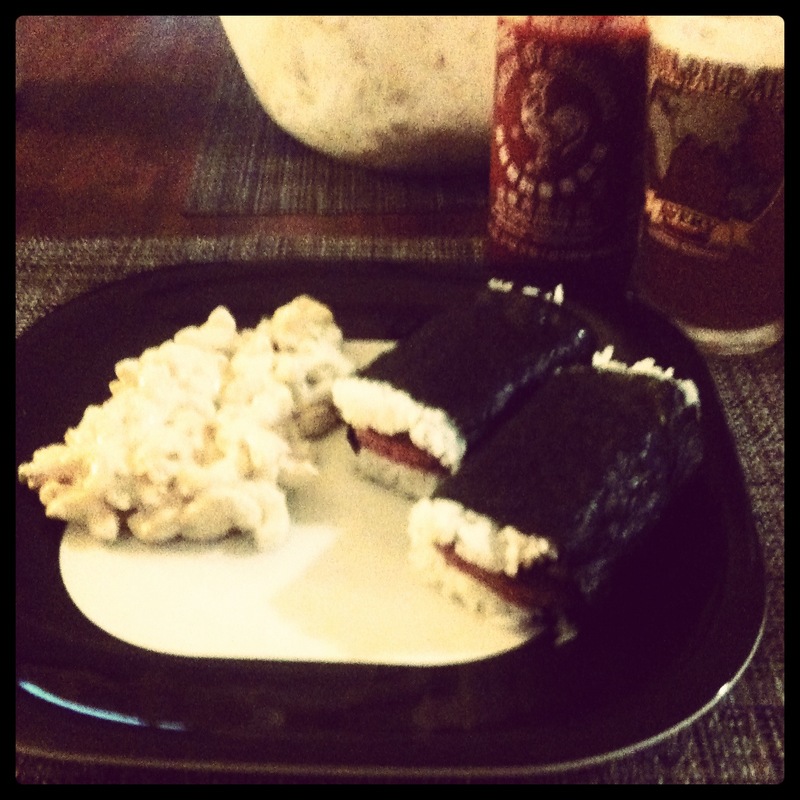 Now once you’ve made all of your Spam Musubi serve with soy sauce and a side of mac daddy salad…. Bring 4 quarts water to boil in large pot. Add 1 tablespoon salt and pasta and cook until very soft, about 15 minutes (you basically want to overcook the pasta, this helps absorb all of the dressing!) Drain pasta and transfer to bowl. Add vinegar and toss until absorbed. Cool pasta 10 minutes, I like to place it in the fridge for a bit. While the pasta is cooling. Whisk 1½ cups milk, 1 cup mayonnaise, sugar, ½ teaspoon salt, and 2 teaspoons pepper in bowl. Once the pasta has been cooled, stir in the dressing until the pasta is well coated. Cool completely. Add scallions, carrot, celery, remaining milk, and remaining mayonnaise to pot with pasta mixture and stir to combine. Season with salt and pepper. Transfer to serving bowl and refrigerate, covered, for at least 1 hour or up to 2 days. Serve. There you have it, my favorite meal ever. 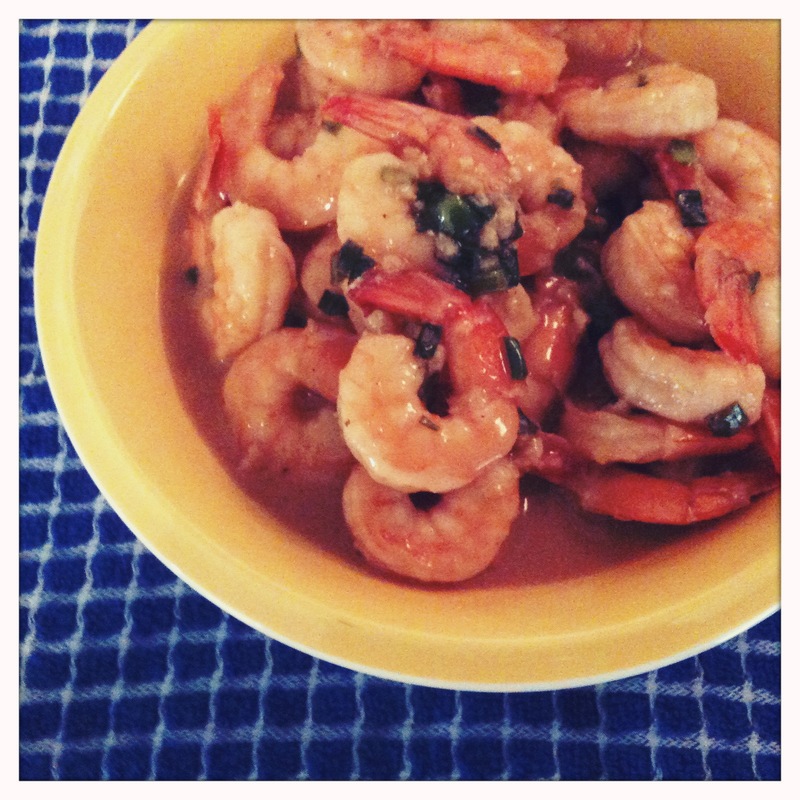 Hello all – it’s time for another Filipino dish of the month: Filipino Garlic Butter Shrimp. I’ve always enjoyed this dish, the only down-side to it was having to peel each and every shrimp as you were eating it. Easy solution… use skinless shrimp! There was nothing better than fresh hot white rice piled with steaming buttery garlic-y shrimp and of course a side of vinegar with more… garlic. MMmm..
My mom only provided me with what ingredients and very basic instructions, so I pretty much winged it and added a little touch of my own. Trying not to compare it with my mom’s version… I’m satisfied with my take on the dish, plus the boyfriend liked it, so that’s always a good thing. I prepped everything before I started cooking because it’s very easy to over cook shrimp. If you’re using frozen shrimp, be sure to defrost the shrimp properly before cooking. First you would chop the green onions and set aside. Melt the butter and saute the garlic, be sure not to brown the garlic too much. Once that’s done, add the shrimp, oyster sauce and green onions, cooking over medium to low heat. Cover and cook for about 3-5 minutes, stirring occasionally. Once you see that the shrimp is cooked, squeeze some lemon and pepper to taste. And you’re done… that was quick wasn’t it? My mom mentioned that you can also add salt to the recipe, I opted not to because of the oyster sauce, but it’s just depends on your preference! Serve on top of rice and if your a true Filipino, a side of vinegar mixed with fish sauce and garlic for dipping! Since I’m making my arroz caldo to my preference, I ground both the garlic and the ginger in a food processor that way it was very fine. My mom would cut up the ginger in bigger pieces but I didn’t like that. So whatever you prefer. Happy St. Patty’s Day Everybody! Personally, I”m not too big on the holiday myself because obviously, I’m not Irish, but it is a good excuse to have to wear my favorite color and drink beer. This evening we have a potluck to attend to in which the hosts will kindly be preparing some corned beef. I decided to make chocolate dipped potato chips. I’ve never tried them myself and I couldn’t see why it wouldn’t be good, I mean, chocolate is great and I love potato chips. So, I looked up the recipe and they turned out so good! 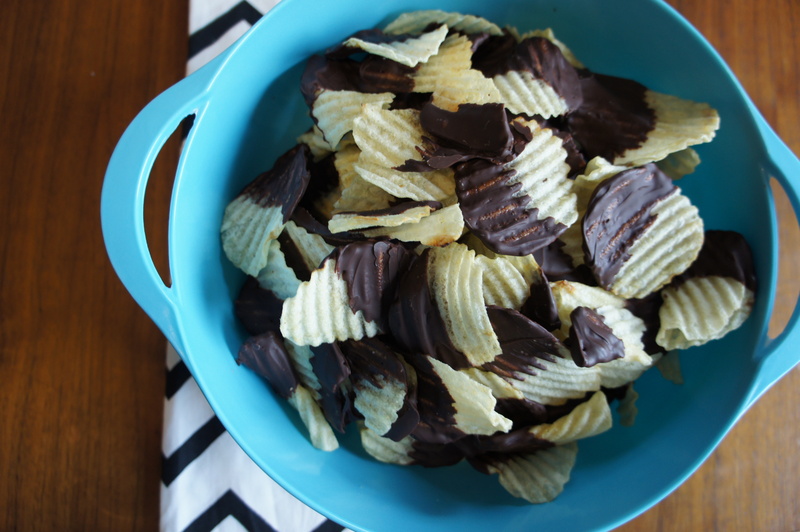 Chocolate and potato chips are a match made in heaven! Line the cookie sheet with wax paper. Melt chocolate chips in the microwave in 45sec-1min intervals stirring in between, do this until all the chocolate is all smooth and melted. Dip the chips halfway in chocolate, one at a time. And remove excess chocolate with a spoon or a spatula, you don’t want TOO much chocolate, otherwise it would be way too rich.. unless that’s what you prefer! Then you just place the chip on the wax paper lined cookie sheet. Once the cookie sheet is full you just refrigerate the chips until the chocolate is set (this really only takes a few minutes) and you’re done! You can serve these immediately or you need to store the chips in a tightly covered container because nobody likes stale chips, even if they’re dipped in chocolate. Create a business name and logo. Set up my creativity/crafting room. Create at least 50 DIY projects/crafts within the year. Start up a shop on Etsy. Create a business card/thank you card. Another thing to look forward to for the future of this blog is witnessing the boyfriend and I transform this cute little house on Cottonwood St from a house to a home! 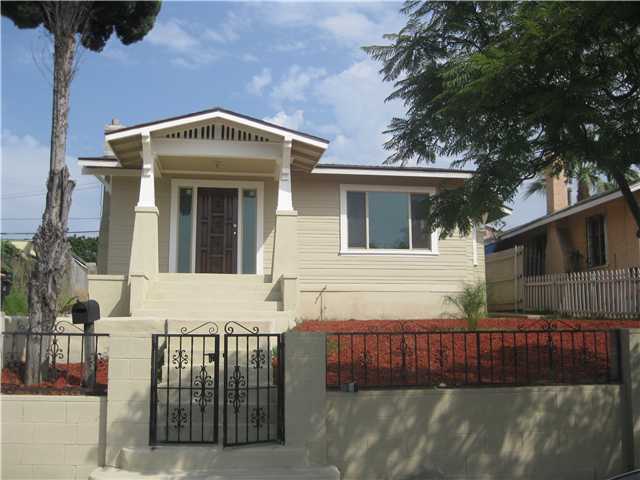 He had recently purchased a great little craftsman bungalow and although the house has come a long (LONG) way from the condition that it was in before, it still does need some work and personalization. We’re scheduled to start moving early February. Isn’t it just ADORABLE?! I love it. We’re both so very excited! I plan to share how we decide to decorate, paint, plant, install, and whatever else this house needs and I’ll also be sharing with you the progress of my goals… thank you so much for reading and check back soon.